American test pilot astronaut 1966-1992. Status: Inactive; Active 1966-1992. Born: 1931-05-09. Spaceflights: 4 . Total time in space: 31.08 days. Birth Place: Longmont, Colorado. PERSONAL DATA: Born in Longmont, Colorado, May 9, 1931. Married to the former Beverly Ann Whitnel. Two daughters and four sons. Enjoys running to stay in condition, hiking, skiing, and camping. EDUCATION: Graduated from Longmont High School, Longmont, Colorado; received a bachelor of science degree in Business from the University of Colorado in 1953, a bachelor of science degree in Aeronautical Engineering from there in 1960, and a master's degree in Business Administration from the UCLA in 1964. ORGANIZATIONS: Fellow, American Institute of Aeronautics and Astronautics, Society of Experimental Test Pilots, and American Astronautical Society. Registered Professional Engineer in Texas. Member, Sigma Nu. SPECIAL HONORS: JSC Certificate of Commendation (1970); NASA Distinguished Service Medals (1975 & 1992); NASA Exceptional Service Medals (1974 & 1988); Zeta Beta Tau's Richard Gottheil Medal (1975); Wright Brothers International Manned Space Flight Award (1975); VFW National Space Award (1976 & 1984); Sigma Nu Distinguished Alumnus of the Year Award (1976); Federation Aeronautique Internationale (FAI) Yuri Gagarin Gold Medal (1976); University of Colorado Alumnus of the Century (1 of 12) (1976); AIAA Special Presidential Citation (1977); American Astronautical Society's Flight Achievement Award for 1976 (1977); AIAA Haley Astronautics Award (1978); JSC Special Achievement Award (1978); Harmon Trophy (Astronaut) (1993); FAI De La Vaulx Medal (1983); NASA Space Flight Medals (1983, 1984, 1992); Distinguished Visiting Lecturer at University of Colorado (1984); De Molay Hall of Honor (1989); FAI Komarov Awards (1983 & 1991); University of Colorado George Norlin Award (1991); De Molay Legion of Honor (1993). International Space Hall of Fame (1996), U.S. Astronaut Hall of Fame (1997). Meritorious Executive, U.S. Senior Executive Service (1997); Honorary Doctor of Science Degree from University of Colorado (2000); International Aerospace Hall of Fame (2001); Oklahoma Aviation and Space Hall of Fame (2005); Russian Republic Tsiolkovski Award (2005) and ASE Crystal Helmet Award (2005). EXPERIENCE: Military. Commissioned officer and naval aviator with the U.S. Marine Corps from 1953 to 1957. Military assignments included a 15-month tour in Japan as a jet fighter pilot. Following release from active duty, Brand continued in Marine Corps Reserve and Air National Guard jet fighter squadrons until 1964. Pre-NASA Civilian: Employed as a civilian by the Lockheed Aircraft Corporation from 1960 to 1966, he worked initially as a flight test engineer on the Navy's P3A aircraft. In 1963, Brand graduated from the U.S. Naval Test Pilot School and was assigned to Palmdale, California as an experimental test pilot on Canadian and German F-104 programs. Just prior to selection to the astronaut program, Brand worked at the West German F-104G Flight Test Center at Istres, France as an experimental test pilot and leader of a Lockheed flight test advisory group. Flight Experience: 9,669 flying hours, which includes 8,089 hours in jets, 391 hours in helicopters, 746 hours in spacecraft, and checkout in more than 30 types of military aircraft. NASA EXPERIENCE: One of the 19 pilot astronauts selected by NASA in April 1966, Brand initially was a crew member in the thermal vacuum chamber testing of the prototype Command Module and support crewman on Apollo 8 and 13. Later he was backup command module pilot for Apollo 15 and backup commander for Skylabs 3 and 4. As an astronaut he held management positions relating to spacecraft development, acquisition, flight safety and mission operations. Brand flew on four space missions; Apollo-Soyuz, STS-5, STS 41-B, and STS-35. He has logged 746 hours in space and has commanded three Shuttle missions. Mr. 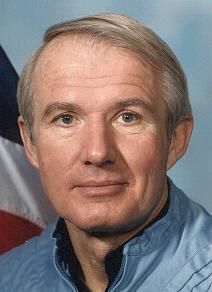 Brand departed the Astronaut Office in 1992 to become Chief of Plans at the National Aerospace Plane (NASP) Joint Program Office at Wright-Patterson Air Force Base, Dayton, Ohio. In September 1994, he moved to California to become Assistant Chief of Flight Operations at the Dryden Flight Research Center, then Acting Chief Engineer, Deputy Director for Aerospace Projects and finally Acting Associate Center Director for Programs. Mr. Brand retired from NASA in January 2008. SPACE FLIGHT EXPERIENCE: Apollo Soyuz: Brand was launched on his first space flight on July 15, 1975, as Apollo command module pilot on the Apollo-Soyuz Test Project (ASTP) mission. This flight resulted in the historic meeting in space between American astronauts and Soviet cosmonauts. Other crewmen on this 9-day Earth-orbital mission were Thomas Stafford, Apollo commander, Donald Slayton, Apollo docking module pilot, cosmonaut Alexey Leonov, Soyuz commander; and cosmonaut Valeriy Kubasov, Soyuz flight engineer. The Soyuz spacecraft was launched at Baikonur in Central Asia, and the Apollo was launched 7 1/2 hours later at the Kennedy Space Center. Two days later Apollo accomplished a successful rendezvous and docking with Soyuz. The linkup tested a unique, new docking system and demonstrated international cooperation in space. There were 44 hours of docked joint activities which included 4 crew transfers between the Apollo and the Soyuz. Six records for docked and group flight were set on the mission and are recognized by the Federation Aeronautique Internationale. Apollo splashed down in the Pacific Ocean near Hawaii, on July 25, and was promptly recovered by the USS New Orleans. Mission duration was 2l7 hours. STS-5: Brand was commander of Columbia for STS-5, the first fully operational flight of the Shuttle Transportation System, which launched on November 11, 1982. His crew comprised Colonel Robert Overmyer, pilot, and two mission specialists, Dr. Joseph Allen and Dr. William Lenoir. STS-5, the first mission with a four man crew, demonstrated the Shuttle as operational by the successful first deployment of two commercial communications satellites from the Orbiter's payload bay. The mission marked the Shuttle's first use of an upper stage rocket, the Payload Assist Module (PAM-D). The satellites were deployed for Satellite Business Systems Corporation of McLean, Virginia, and TELESAT of Ottawa, Canada. Two FAI records for mass to altitude were set on the mission. Numerous flight tests were performed to ascertain Shuttle performance. STS-5 was the last flight to carry the Development Flight Instrumentation package to support extensive flight testing. The STS-5 crew concluded the 5-day orbital flight of Columbia with the landing approach through a cloud deck to Runway 22 at Edwards Air Force Base, California on November 16, 1982. Mission duration was 122 hours. STS 41-B: Brand commanded Challenger with a crew of five on the tenth flight of the Space Shuttle. The launch was on February 3, 1984. His crew included Commander Robert Gibson, pilot, and 3 mission specialists, Captain Bruce McCandless, II, Dr. Ronald McNair, and Lt. Col. Robert Stewart. The flight accomplished the proper shuttle deployment of two Hughes 376 communications satellites which failed to reach desired geosynchronous orbits due to upper stage solid rocket failures. This mission marked the first flight checkout of the Manned Maneuvering Unit (MMU) and the Manipulator Foot Restraint (MFR) with McCandless and Stewart performing two spectacular extravehicular activities (EVA's). Shuttle rendezvous sensors and computer programs were flight tested for the first time. The 8-day flight of Challenger ended with the first landing to the runway at the Kennedy Space Center on February 11, 1984. Mission duration was 191 hours. STS-35: Brand again commanded Columbia on the thirty-eighth flight of the Shuttle, this time with a crew of seven. The night launch on December 2, 1990 started a 9-day mission devoted to round-the-clock observations of stars and other celestial objects. Crewmen included the pilot, Col. Guy Gardner; three mission specialists, Mike Lounge, Dr. Robert Parker and Dr. Jeffrey Hoffman; and two payload specialists, Dr. Samuel Durrance and Dr. Ronald Parise. The 13-ton payload consisted of the 3 ASTRO-1 Ultraviolet (UV) Telescopes and the Broad Band X-ray Telescope. More than 200 Orbiter maneuvers were required to point the telescopes. This Shuttle flight, the first dedicated to astronomy, provided a rich return of science data with emphasis on observation of very active celestial objects. A night landing was made on December 10 to Runway 22 at Edwards Air Force Base. Mission duration was 215 hours. This is the only information available through NASA. Updates must be sought direct from the abovenamed individual. BIRTHPLACE AND DATE: Born in Longmont, Colorado, May 9, 1931. His mother Mrs. Donna M. Brand, resides in Longmont. PHYSICAL DESCRIPTION: Gray hair; gray eyes; 5 feet 11 inches; 182 pounds. EDUCATION: Graduated from Longmont High School, Longmont, Colorado; received a bachelor of science degree in Business from the University of Colorado in 1953, a bachelor of science degree in Aeronautical Engineering from the University of Colorado in 1960, and a master's degree in Business Administration from the University of California at Los Angeles in 1964. MARITAL STATUS: Married to the former Beverly Ann Whitnel. CHILDREN: Susan N., April 30, 1954; Stephanie, August 6, 1955; Patrick R., March 22, 1958; Kevin S., December 1, 1963; Erik R., May 11, 1981; and Dane V., October 1, 1985. RECREATIONAL INTERESTS: Enjoys running to stay in condition, hiking, skiing, and camping. ORGANIZATIONS: Fellow, American Institute of Aeronautics and Astronautics, Society of Experimental Test Pilots, and American Astronautical Society. Registered Professional Engineer in Texas. Member, Sigma Nu and Beta Gamma Sigma. SPECIAL HONORS: JSC Certificate of Commendation (1970); two NASA Distinguished Service Medal (1975 & 1992); the NASA Exceptional Service Medal (1974 & 1988); Zeta Beta Tau's Richard Gottheil Medal (1975); the Wright Brothers International Manned Space Flight Award (1975); the Veterans of Foreign Wars National Space Award (1976 & 1984); the Sigma Nu Distinguished Alumnus of the Year Award (1976); the Federation Aeronautique Internationale (FAI) Yuri Gagarin Gold Medal (1976); University of Colorado Alumnus of the Century (1 of 12) (1976); the AIAA Special Presidential Citation (1977); the American Astronautical Society's Flight Achievement Award for 1976 (1977); the AIAA Haley Astronautics Award (1978); the JSC Special Achievement Award (1978); Harmon Trophy (Astronaut)(1983); the FAI De La Vaulx Medal (1983); three NASA Space Flight Medals (1983, 1984, 1992); Distinguished Visiting Lecturer at University of Colorado (1984); De Molay Hall of Fame (1989); two FAI komarov awards (1983 & 1991); and the University of Colorado George Norlin Award (1991). in Japan as a jet fighter pilot. Following release from active duty, Brand continued in Marine Corps Reserve and Air National Guard jet fighter squadrons until 1964. "Civilian". Employed as a civilian by the Lockheed Aircraft Corporation from 1960 to 1966, he worked initially as a flight test engineer on the Navy's P3A aircraft. In 1963, Brand graduated from the U.S. Naval Test Pilot School and was assigned to Palmdale, California, as an experimental test pilot on Canadian and German F-104 programs. Prior to selection to the astronaut program, Brand worked at the West German F-104G Flight Test Center at Istres, France, as an experimental test pilot and leader of a Lockheed flight test advisory group. "Flight Experience": 9,669 flying hours, which includes 8,089 hours in jets, 391 hours in helicopters, 746 hours in spacecraft, and checkout in more than 30 types of military aircraft. NASA EXPERIENCE: One of the 19 pilot astronauts selected by NASA in April 1966, Brand's early experience included being a crew member in the thermal vacuum chamber testing of the prototype command module and support crewman on Apollo 8 and 13. He was backup command module pilot for Apollo 15 and backup commander for Skylabs 3 and 4. Later he flew on four missions; Apollo-Soyuz, STS-5, STS-41B, and STS-35. "Apollo-Soyuz": Brand was launched on his first space flight on July 15, 1975, as Apollo command module pilot on the Apollo-Soyuz Test Project (ASTP) mission. This flight resulted in the historic meeting in space between American astronauts and Soviet cosmonauts. Other crewmen on this 9-day Earth-orbital mission were Thomas Stafford, Apollo commander; Donald Slayton, Apollo docking module pilot; cosmonaut Alexey Leonov, Soyuz commander; and cosmonaut Valeriy Kubasov, Soyuz flight engineer. The Soyuz spacecraft was launched at Baikonur in Central Asia, and the Apollo was launched 7-1/2 hours later at the Kennedy Space Center. Two days later the Apollo accomplished a successful rendezvous and docking with Soyuz. The linkup tested a unique, new docking system and demonstrated international cooperation in space. There were 44 hours of docked joint activities which included 4 crew transfers between the Apollo and the Soyuz. Twenty-eight experiments were performed during the flight. Six records for docked and group flight were set on the mission and are recognized by the Federation Aeronautique Internationale. Apollo splashed down in the Pacific Ocean near Hawaii, on July 25, less than a mile from the targeted splash point, and was promptly recovered by the USS NEW ORLEANS. Mission duration was 217 hours. STS-5: Brand was commander of STS-5, the first fully operational flight of the Shuttle Transportation System, which launched Columbia on November 11, 1982. His crew comprised Colonel Robert Overmyer, pilot, and two mission specialists, Dr. Joseph Allen and Dr. William Lenoir. STS-5, the first mission with a four man crew, demonstrated the Shuttle as operational by the successful first deployment of two commercial communications satellites from the Orbiter's payload bay. The mission marked the Shuttle's first use of an upper stage rocket, the Payload Assist Module (PAM-D). The satellites were deployed for Satellite Business Systems Corporation of McLean, Virginia, and TELESAT of Ottawa, Canada. Two FAI records for mass to altitude were set on the mission. Numerous flight tests were performed to ascertain Shuttle performance. STS-5 was the last flight to carry the Development Flight Instrumentation package to support extensive flight testing. A Getaway Special, three student projects and medical experiments were included on the mission. The STS-5 crew successfully concluded the 5-day orbital flight of Columbia with the landing approach through a cloud deck to Runway 22 at Edwards Air Force Base, California on November 16, 1982. Mission duration was 122 hours. STS 41-B: Brand commanded Challenger with a crew of five on the tenth flight of the Space Shuttle. The launch was on February 3, 1984. His crew included Commander Robert Gibson, pilot, and 3 mission specialists, Captain Bruce McCandless II, Dr. Ronald McNair, and Lt. Col. Robert Stewart. The flight accomplished the proper shuttle deployment of two Hughes 376 communications satellites which failed to reach desired geosynchronous orbits due to upper stage rocket failures. This mission marked the first flight checkout of the Manned Maneuvering Unit (MMU), and the Manipulator Foot Restraint (MFR), with McCandless and Stewart performing two spectacular extravehicular activities (EVA's). Shuttle rendezvous sensors and computer programs were flight tested for the first time. In addition the German Shuttle Pallet Satellite (SPAS), Remote Manipulator System (RMS), 6 Getaway Specials, and materials processing experiments were included on the mission. The 8-day flight of Challenger ended with the first landing to the runway at the Kennedy Space Center on February 11, 1984. Mission duration was 191 hours. STS-35: Brand again commanded Columbia on the thirty-eighth flight of the Shuttle, this time with a crew of seven. The spectacular night launch on December 2, 1990 started a 9-day mission devoted to round-the-clock observations of stars and other celestial objects. Crewmen included the pilot, Col. Guy Gardner; three mission specialists, Mike Lounge, Dr. Robert Parker and Dr. Jeffrey Hoffman; and two payload specialists, Dr. Samuel Durrance and Dr. Ronald Parise. The 13-ton payload consisted of the 3 ASTRO-1 Ultraviolet (UV) Telescopes and the Broad Band X-ray Telescope. More than 200 Orbiter maneuvers were required to point the telescopes. Other activities included Orbiter engineering flight tests, medical experiments, the Shuttle Amateur Radio Experiment, and downlinked educational TV programs. This Shuttle flight, the first dedicated to astronomy, provided a rich return of science data to better understand the nature of the universe with emphasis on observation of very active celestial objects. A night landing was made on December 10 to Runway 22 at Edwards Air Force Base. Mission duration was 215 hours. With the completion of this flight Brand has logged 746 hours in space, and has commanded three Shuttle missions. CURRENT ASSIGNMENT: Mr. Brand is currently Director of Plans for the National Aerospace Plane (NASP) Program. In this role he is assigned out of NASA Headquarters to the NASP joint Program Office at Wright-Patterston Air Force Base, Dayton, Ohio. Family: Astronaut. Country: USA. Spacecraft: Skylab. Flights: Apollo 13, Apollo 15, Apollo 18, Skylab 3, Skylab Rescue, Skylab 4, Skylab 5, Apollo (ASTP), STS-5, STS-41-B, STS-61-K, STS-35. Projects: Apollo, ASTP, STS. Agency: USMC. Bibliography: 12, 5197. 1931 May 9 - . Birth of Vance DeVoe Brand - . Nation: USA. Related Persons: Brand. American test pilot astronaut 1966-1992. 4 spaceflights, 31.1 days in space. Flew to orbit on ASTP (1975), STS-5, STS-41B, STS-35..
1971 July 26 - . 13:34 GMT - . Launch Site: Cape Canaveral. Launch Complex: Cape Canaveral LC39A. Launch Platform: LUT3. Launch Vehicle: Saturn V.
Apollo 15 - . Call Sign: Endeavour. Crew: Irwin, Scott, Worden. Backup Crew: Brand, Gordon, Schmitt. Payload: Apollo CSM 112/LM 10/ ALSEP/ LRV-1/PFS 1/S-IVB-510. Mass: 30,343 kg (66,894 lb). Nation: USA. Agency: NASA Houston. Program: Apollo. Class: Moon. Type: Manned lunar spacecraft. Flight: Apollo 15. Spacecraft: Apollo CSM. Duration: 12.30 days. Decay Date: 1971-08-07 . USAF Sat Cat: 5351 . COSPAR: 1971-063A. Apogee: 169 km (105 mi). Perigee: 166 km (103 mi). Inclination: 29.68 deg. Period: 87.84 min. Apollo 15 (AS-510) with astronauts David R. Scott, Alfred M. Worden, and James B. Irwin aboard was launched from Pad A, Launch Complex 39, KSC, at 9:34 a.m. EDT July 26. The spacecraft and S-IVB combination was placed in an earth parking orbit 11 minutes 44 seconds after liftoff. Activities during earth orbit and translunar injection (insertion into the trajectory for the moon) were similar to those of previous lunar landing missions. Translunar injection was at about 12:30 p.m., with separation of the CSM from the LM/S-IVB/IU at 12:56 p.m. At 1:08 p.m., onboard color TV showed the docking of the CSM with the LM. S-IVB auxiliary propulsion system burns sent the S-IVB/IU stages toward the moon, where they impacted the lunar surface at 4:59 p.m. EDT July 29. The point of impact was 188 kilometers northeast of the Apollo 14 landing site and 355 kilometers northeast of the Apollo 12 site. The impact was detected by both the Apollo 12 and Apollo 14 seismometers, left on the moon in November 1969 and February 1971. After the translunar coast, during which TV pictures of the CSM and LM interiors were shown and the LM communications and other systems were checked, Apollo 15 entered lunar orbit at 4:06 p.m. EDT July 29. The LM-10 Falcon , with astronauts Scott and Irwin aboard, undocked and separated from the Endeavor (CSM 112) with astronaut Worden aboard. At 6:16 p.m. EDT July 30, the Falcon landed in the Hadley-Apennine region of the moon 600 meters north-northwest of the proposed target. About two hours later, following cabin depressurization, Scott performed a 33-minute standup EVA in the upper hatch of the LM, during which he described and photographed the landing site. The first crew EVA on the lunar surface began at 9:04 a.m. July 31. The crew collected and stowed a contingency sample, unpacked the ALSEP and other experiments, and prepared the lunar roving vehicle (LRV) for operations. Some problems were encountered in the deployment and checkout of the LRV, used for the first time, but they were quickly resolved. The first EVA traverse was to the Apennine mountain front, after which the ALSEP was deployed and activated, and one probe of a Heat Flow experiment was emplaced. A second probe was not emplaced until EVA-2 because of drilling difficulties. The first EVA lasted 6 hours 33 minutes. At 7:49 a.m. EDT August 1, the second EVA began. The astronauts made a maintenance check on the LRV and then began the second planned traverse of the mission. On completion of the traverse, Scott and Irwin completed the placement of heat flow experiment probes, collected a core sample, and deployed the American flag. They then stowed the sample container and the film in the LM, completing a second EVA of 7 hours 12 minutes. The third EVA began at 4:52 a.m. August 2, included another traverse, and ended 4 hours 50 minutes later, for a total Apollo 15 lunar surface EVA time of 18 hours 35 minutes. While the lunar module was on the moon, astronaut Worden completed 34 lunar orbits in the CSM operating scientific instrument module experiments and cameras to obtain data concerning the lunar surface and environment. X-ray spectrometer data indicated richer abundance of aluminum in the highlands, especially on the far side, but greater concentrations of magnesium in the maria. Liftoff of the ascent stage of the LM, the first one to be televised, occurred at 1:11 p.m. EDT August 2. About two hours later the LM and CSM rendezvoused and docked, and film, equipment, and 77 kilograms of lunar samples were transferred from the LM to the CSM. The ascent stage was jettisoned and hit the lunar surface at 11:04 p.m. EDT August 2. Its impact was recorded by the Apollo 12 , Apollo 14 , and Apollo 15 seismometers, left on the moon during those missions. Before leaving the lunar orbit, the spacecraft deployed a subsatellite, at 4:13 p.m. August 4, in an orbit of 141.3 by 102 kilometers. The satellite would measure interplanetary and earth magnetic fields near the moon. It also carried charged-particle sensors and equipment to detect variations in lunar gravity caused by mascons (mass concentrations). A transearth injection maneuver at 5:23 p.m. August 4 put the CSM on an earth trajectory. During the transearth coast, astronaut Worden performed an inflight EVA beginning at 11:32 a.m. August 5 and lasting for 38 minutes 12 seconds. He made three trips to the scientific instrument module (SIM) bay of the SM, twice to retrieve cassettes and once to observe the condition of the instruments in the SIM bay. Skylab Rescue (cancelled) - . Crew: Brand, Lind. Nation: USA. Related Persons: Brand, Lind. Program: Skylab. Flight: Skylab 3, Skylab Rescue. Spacecraft Bus: Apollo CSM. Spacecraft: Apollo Rescue CSM. Influenced by the stranded Skylab crew portrayed in the book and movie 'Marooned', NASA provided a crew rescue capability for the only time in its history. A kit was developed to fit out an Apollo command module with a total of five crew couches. In the event a Skylab crew developed trouble with its Apollo CSM return craft, a rescue CSM would be prepared and launched to rendezvous with the station. It would dock with the spare second side docking port of the Skylab docking module. During Skylab 3, one of the thruster quads of the Apollo service module developed leaks. When the same problem developed with a second quad, the possibility existed that the spacecraft would not be maneuverable. Preparation work began to fit out a rescue CSM, and astronauts Vance Brand and Don Lind began preparations to rescue astronauts Bean, Garriott, and Lousma aboard the station. However the problem was localized, work arounds were developed, and the first space rescue mission was not necessary. The Skylab 3 crew returned successfully in their own Apollo CSM at the end of their 59 day mission. 1973 November 16 - . 14:01 GMT - . Launch Site: Cape Canaveral. Launch Complex: Cape Canaveral LC39B. Launch Platform: LUT1. LV Family: Saturn I. Launch Vehicle: Saturn IB. Skylab 4 - . Call Sign: Skylab. Crew: Carr, Gibson, Edward, Pogue. Backup Crew: Brand, Lenoir, Lind. Payload: Apollo CSM 118. Mass: 20,847 kg (45,959 lb). Nation: USA. Agency: NASA Houston. Program: Skylab. Class: Moon. Type: Manned lunar spacecraft. Flight: Skylab 4. Spacecraft: Apollo CSM. Duration: 84.05 days. Decay Date: 1974-02-08 . USAF Sat Cat: 6936 . COSPAR: 1973-090A. Apogee: 437 km (271 mi). Perigee: 422 km (262 mi). Inclination: 50.00 deg. Period: 93.10 min. Final Skylab mission; included observation and photography of Comet Kohoutek among numerous experiments. Completed 1,214 Earth orbits and four EVAs totalling 22 hours, 13 minutes. Increased manned space flight time record by 50%. Rebellion by crew against NASA Ground Control overtasking led to none of the crew ever flying again. Biological experiments included two Mummichog fish (Fundulus heteroclitus). The space vehicle consisted of a modified Apollo CSM and a Saturn IB launch vehicle. All launch phase events were normal, and the CSM was inserted into a 150.1- by 227.08-km orbit. The rendezvous sequence was performed according to the anticipated timeline. Stationkeeping was initiated about seven and one-half hours after liftoff, and hard docking was achieved about 30 minutes later following two unsuccessful docking attempts. Planned duration of the mission was 56 days, with the option of extending it to a maximum of 84 days. Skylab 5 (cancelled) - . Crew: Brand, Lenoir, Lind. Nation: USA. Related Persons: Brand, Lenoir, Lind. Program: Skylab. Flight: Skylab 5. Spacecraft: Apollo CSM. After completion of the three programmed Skylab flights, NASA considered using the remaining backup Saturn IB and Apollo CSM to fly a fourth manned mission to Skylab. It would have been a short 20 day mission to conduct some new scientific experiments and boost Skylab into a higher orbit for later use by the shuttle. But NASA was confident that Skylab would stay in orbit until shuttle flights began in 1978 - 1979. But the shuttle was delayed, and Skylab crashed to earth before the first shuttle mission was flown. 1975 July 24 - . Landing of Apollo (ASTP) - . Return Crew: Brand, Slayton, Stafford. Nation: USA. Related Persons: Brand, Slayton, Stafford. Program: ASTP. Flight: Apollo (ASTP). Apollo (ASTP) landed at 21:18 GMT, 7.3 km from the recovery ship New Orleans. It was the last splashdown of an American space capsule. However the flight of the last Apollo spacecraft was marred by the fact that the crew almost perished while the capsule was descending under its parachute. A failure in switchology led the automatic landing sequence to be not armed at the same time the reaction control system was still active. When the Apollo hadn't begun the parachute deployment sequence by 7,000 metres altitude, Brand hit the manual switches for the apex cover and the drogues. The manual deployment of the drogue chutes caused the CM to sway, and the reaction control system thrusters worked vigorously to counteract that motion. When the crew finally armed the automatic ELS 30 seconds later, the thruster action terminated. STS-5 - . Call Sign: Columbia. Crew: Allen, Brand, Lenoir, Overmyer. Payload: Columbia F05 / SBS 3 [PAM-D] / Anik C3 [PAM-D]. Mass: 14,551 kg (32,079 lb). Nation: USA. Related Persons: Allen, Brand, Lenoir, Overmyer. Agency: NASA Houston. Program: STS. Class: Manned. Type: Manned spaceplane. Flight: STS-5. Spacecraft Bus: Shuttle. Spacecraft: Columbia. Duration: 5.09 days. Decay Date: 1982-11-16 . USAF Sat Cat: 13650 . COSPAR: 1982-110A. Apogee: 317 km (196 mi). Perigee: 294 km (182 mi). Inclination: 28.50 deg. Period: 90.50 min. Manned four crew. First mission to deploy commercial communications satellites (SBS 3, Anik C3). Payloads: : Satellite Business Systems (SBS)-C with Payload Assist ; (PAM)-D; Telesat-E (Canadian communications satellite) with PAM-D. Monodisperse Latex Reactor (MLR), Continuous Flow Electrophoresis System (CFES), three getaway specials (GAS), Student experiments, GLOW experiment, Vestibular experiment, Oxygen Interaction With Materials experiment. 1982 November 16 - . Landing of STS-5 - . Return Crew: Allen, Brand, Lenoir, Overmyer. Nation: USA. Related Persons: Allen, Brand, Lenoir, Overmyer. Program: STS. Flight: STS-5. STS-5 landed at 14:33 GMT. .
STS-41-B - . Call Sign: Challenger. Crew: Brand, Gibson, McCandless, McNair, Stewart. Payload: Challenger F04 / SPAS 1A. Mass: 15,362 kg (33,867 lb). Nation: USA. Related Persons: Brand, Gibson, McCandless, McNair, Stewart. Agency: NASA Houston. Program: STS. Class: Manned. Type: Manned spaceplane. Flight: STS-41-B. Spacecraft Bus: Shuttle. Spacecraft: Challenger. Duration: 7.97 days. Decay Date: 1984-02-11 . USAF Sat Cat: 14681 . COSPAR: 1984-011A. Apogee: 316 km (196 mi). Perigee: 307 km (190 mi). Inclination: 28.50 deg. Period: 90.80 min. Manned five crew. Deployed Westar 6, Palapa B2; tested Manned Maneuvering Unit (MMU). Payloads: PALAPA-B2 (Indonesian communications satellite) with Payload Assist Module (PAM)-D and WESTAR (Western Union communications satellite)-Vl with PAM-D. Both satellites were deployed but the PAM-D in each satellite failed to ignite, leaving both satellites in earth orbit. Both satellites were retrieved and returned to earth for renovation on the STS-51-A mission. The manned maneuvering unit (MMU) was tested with extravehicular astronauts as free flyers without tethers as far as 98 m from the orbiter. Shuttle Pallet Satellite (SPAS)-01 experiments, Monodisperse Latex Reactor (MLR), Isoelectric Focusing Experiment (lEF), Acoustic Containerless Experiment System (ACES), Cinema 360 cameras, five getaway specials (GAS), Aerodynamic Coefficient Identification (ACIP)/High Resolution Accelerom-eter Package (HIRAP). 1984 February 11 - . Landing of STS-41-B - . Return Crew: Brand, Gibson, McCandless, McNair, Stewart. Nation: USA. Related Persons: Brand, Gibson, McCandless, McNair, Stewart. Program: STS. Flight: STS-41-B. STS-41-B landed at 12:15 GMT. .